Cook the chickpeas (if not using canned) for at least 30 mins and then grind it. Take ½ cup of the ground chickpeas in a mixing bowl and add the chopped onions and chilli. Season with salt and pepper and toss the coriander leaves into the mix. Toss the chickpeas mixture together and then divide into 4 balls. Prepare a batter by mixing the wheat flour with a little water. 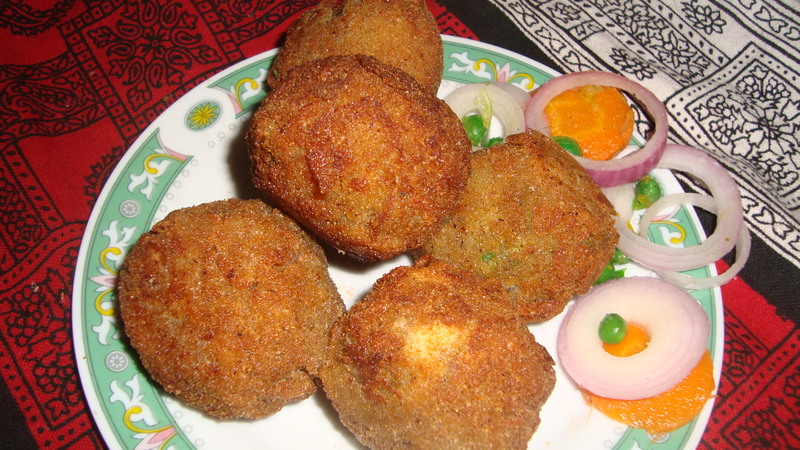 Coat the 4 cutlet balls in the batter and then roll them in the bread crumbs. Deep-fry the cutlets in low-fat oil over medium heat. Transfer the cutlets to a plate lined with grease absorbing paper, before serving. Today’s theme has been egg focused. The third recipe for today is my grandmother’s recipe for egg cutlets, as remembered by my mother. Boil the egg and potato for about 10 minutes. Mash the boiled potato in a bowl and keep aside. Finely chop the boiled egg and add to the mashed potato. Add the finely chopped onion, green chilli to the bowl and add the pepper, salt, fennel seasoning to the cutlet mix. Mix well and divide the mixture into four balls. Whisk lightly the white of an egg in a small bowl. Dip each of the cutlet balls in the egg white and roll them in bread-crumbs. Keep aside. Heat the oil for deep frying the cutlets. 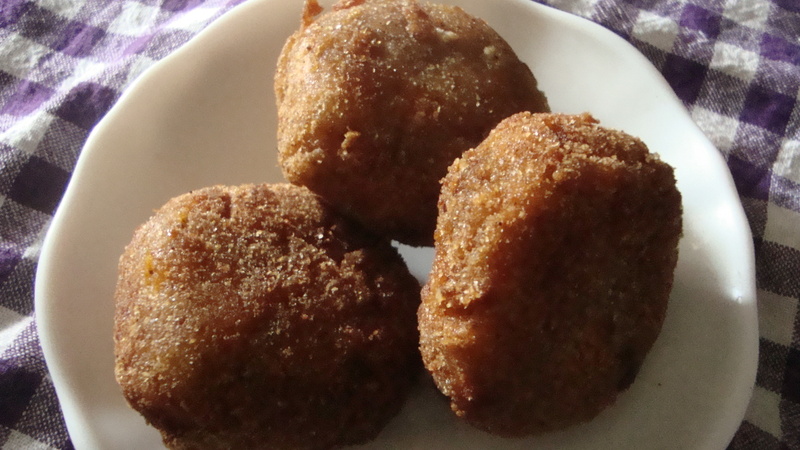 Drop the cutlets into the frying pan and fry them, turning them around so that they are browned on all sides. Remove the cutlets from the frying pan and place them on grease absorbing paper before you serve them with a chilli or tomato sauce. 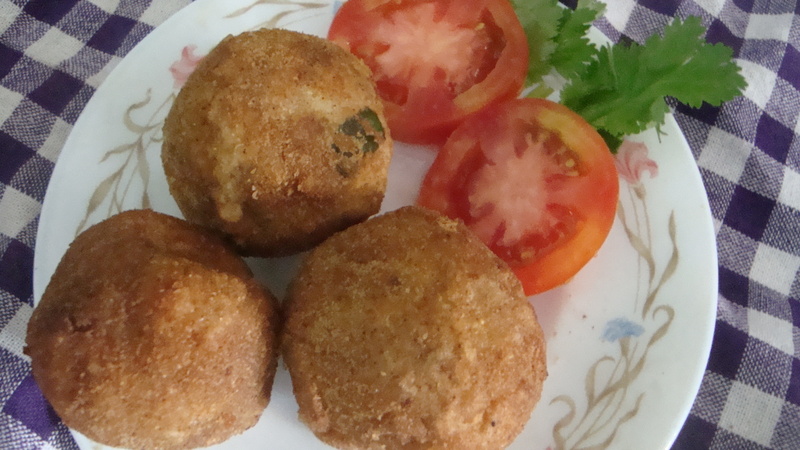 The recipe I would like to share today is my mother’s stuffed vegetable cutlet recipe. Dry grind the pepper and fennel together and keep aside. Boil the potatoes and carrots separately. Peel the skin of the potatoes and mash them, adding some salt and the ground pepper and fennel mix. 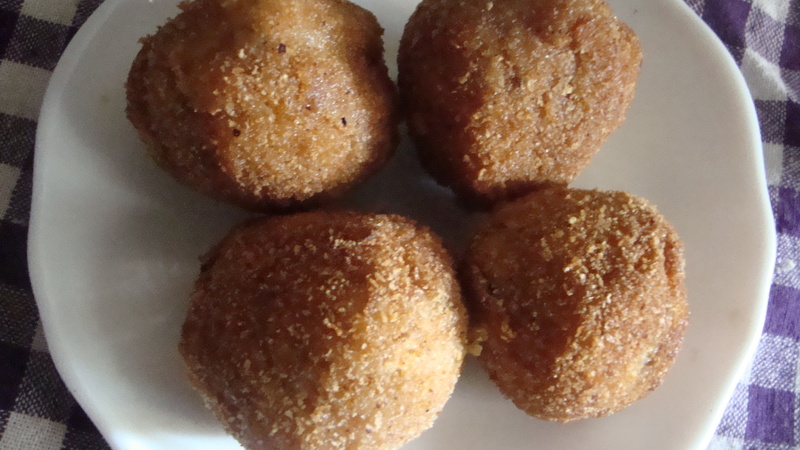 When they have been sufficiently mashed and mixed with the spices, make balls of mashed potato and keep aside. Mash the carrots separately and keep aside. Boil the green peas lightly, if not pre-cooked, and coarsely grind them a little so that they are half mashed. Heat a little oil in a pan. Add the chopped ginger, garlic and onion and sauté lightly. When the aroma begins to waft about, add the mashed carrot and coarsely ground green peas. Add salt and pepper and cook for a few minutes till they come together. Remove from heat. Make a batter by mixing the wheat flour with salt and adding water little by little, till reaches a pancake batter consistency. Take a potato ball and flatten it on your palm. Scoop up 1 – 1 ½ tsp of the carrot and peas mixture. Make the cutlets by covering the mixture with the edges of the potato patty like a dumpling. 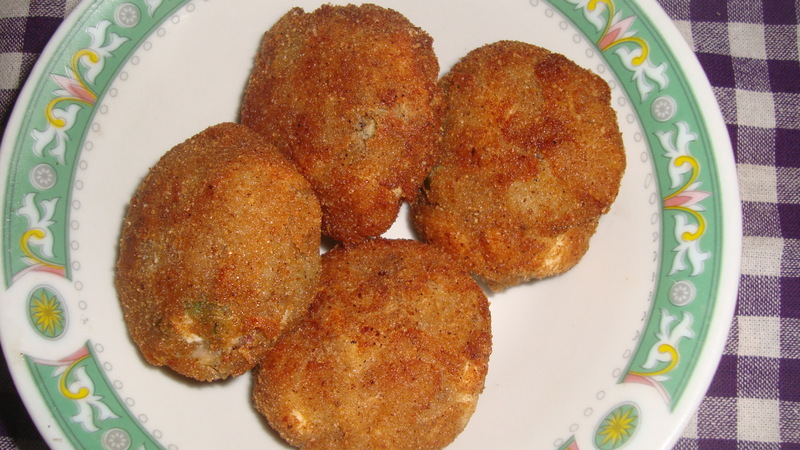 Dip the cutlets in the batter and roll it in the bread crumbs. Keep aside. Heat the oil for deep-frying. The oil should be enough to cover the potato balls. When the oil is ready, drop the batter coated stuffed potato balls in the pan and fry till they are browned on all sides. Serve the stuffed vegetable cutlets with tea. Today’s guest blogger is Krishanti Weerakoon, a staff of UN and wife of the Sri Lankan High Commissioner to Canada. This is a fool-proof Sri Lankan recipe and on all of our postings overseas, this was an absolute favourite. A versatile and excellent snack for coffee mornings, afternoon teas, lunches , cocktail parties,with pre dinner drinks or even with dinner!! Make sure you have enough to go around as these small morsels have an explosion on your taste buds with the spices and aromatics and they are very popular. Reduce the intensity of the chillies depending on your guests’ tolerance for spice!! 1 pint oil for deep frying. Mix all the ingredients except one egg and flour , breadcrumbs and oil in a bowl. Make small balls about the size of a walnut. Break the other egg into a bowl and beat lightly with a fork. Then put the flour and breadcrumbs into two seperate bowls. Follow this order; first roll the cutlet in flour, then egg and lastly breadcrumbs. Treat it like an assembly line!! Use up all the fish mixture this way! Heat oil to smoking point in a wok or fryer. Fry the cutlets until golden brown . Do not add too many at a time as it will lower the temperature of the oil and will not fry evenly. Ensure that oil stays hot when frying to ensure crispy cutlets. Serve with a nice dip either sweet chilli sauce or tomato/barbecue sauce.